Stem cell research has been a problematic endeavour. For the past twenty years it has attracted moral controversies in both the public and the professional sphere. The research involves not only laboratories, clinics and people, but ethics, industries, jurisprudence, and markets. Today it contributes to the development of new therapies and affects increasingly many social arenas. The matrix approach introduced in this book offers a new understanding of this science in its relation to society. The contributions are multidisciplinary and intersectional, illustrating how agency and influence between science and society go both ways. Conceptually, this volume presents a situated and reflexive approach for philosophy and sociology of the life sciences. The practices that are part of stem cell research are dispersed, and the concepts that tie them together are tenuous; there are persistent problems with the validation of findings, and the ontology of the stem cell is elusive. The array of applications shapes a growing bioeconomy that is dependent on patient donations of tissues and embryos, consumers, and industrial support. In this volume it is argued that this research now denotes not a specific field but a flexible web of intersecting practices, discourses, and agencies. 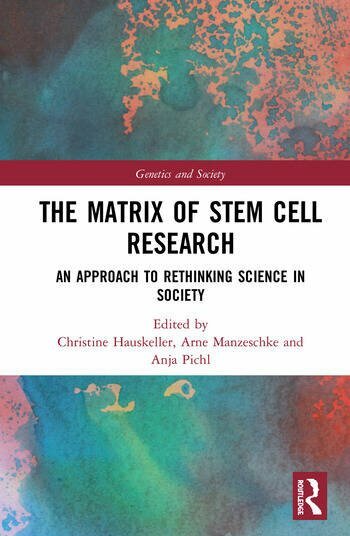 To capture significant parts of this complex reality, this book presents recent findings from researchers, who have studied in-depth aspects of this matrix of stem cell research. This volume presents state-of-the-art examinations from senior and junior scholars in disciplines from humanities and laboratory research to various social sciences, highlighting particular normative and epistemological intersections. The book will appeal to scholars as well as wider audiences interested in developments in life science and society interactions. The novel matrix approach and the accessible case studies make this an excellent resource for science and society courses. Christine Hauskeller is Professor of Philosophy, teaching philosophy of science, bioethics, and feminist theory at the University of Exeter, UK. She conducts empirical philosophical studies on the processes of knowledge production in the life sciences and their intersections with different forms of valuation and normativity. Prof Hauskeller has published widely on stem cell research for the past twenty years and has led many projects on the subject area. Appointments to advisory and governance boards include the UK BBSRC Science and Society Panel, and the German Federal Government’s Central Ethics Committee Stem Cell Research. Arne Manzeschke is Professor of Anthropology and Ethics at the Lutheran University of Applied Sciences Nuremberg, Germany, Director of the Institute of Ethics and Anthropology in Health Care, President of Societas Ethica, European Society for research in ethics, and he is vice chairman of the Bavarian Ethics Commission on Preimplantation Genetic Diagnosis. Arne was a member of ForIPS – Bavarian Research Network Induced Pluripotent Stem Cells. He conducts ethical research in the field of bioethics and the ethics of technology, especially digitalization and the human-machine-interaction. Anja Pichl is a doctoral student at Bielefeld University, Germany, in the DFG research training group 2073 Integrating Ethics and Epistemology of Scientific Research. Her dissertation investigates the limits of biological knowledge using the example of stem cell research. Together with Arne Manzeschke she organized an international and interdisciplinary summer school on pluripotent stem cells in 2015, funded by the German Federal Ministry of Education and Research (BMBF).